It's been another month of amazing entries. We are thrilled with the participation and with the gorgeous stenciled cards submitted by everyone. 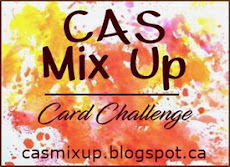 Each entry is truly a work of art and we appreciate you taking the time to share with us at CAS Mix up! Thank you. Below is just a few of the outstanding entries from this month, along with our "Pick of the Month". We hope you enjoyed playing along and that you'll come join us again for a new challenge in May. We love the soft watercolour background Barb created, which highlights the texture and depth of the beautiful stenciled frond. The heat embossed sentiment and dew drops add lots of sparkle and shine. Gorgeous! May's challenge starts in a few days. See you on May 1st! We are already half way through April ... time is flying by! :) The challenge is open until April 24th, so there's still lots of time to play along. We are really enjoying seeing all the gorgeous stenciled cards in the gallery. We are providing more sample cards to show you how easy it is to add a bit of mixed media techniques or products to your CAS cards. 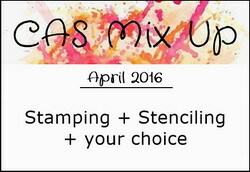 Welcome to April's Challenge at CAS Mix Up! We are THRILLED with the number of entries for our first challenge last month. So many creative and unique cards using watercolouring. Thanks to everyone who played along. Just a reminder that we are a CAS (clean and simple) mixed media challenge. It's important to include some "open space" on your cards. Thank you! This month we want to see some stenciling your cards. Make sure to include some stamping (a little or a lot), stenciling, and then pick something from the "Your Choice" list in the right sidebar to add in. Stenciling is fun! There are so many different ways to stencil and many techniques that use stenciling --- sponging, embossing pastes and gels, versamark and heat embossing, monoprinting ... just to name a few! 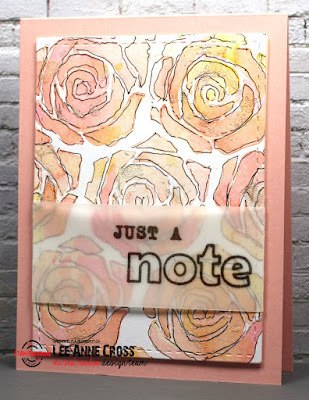 We are so excited to have Lee-Anne Cross (Creatively LA) as our Featured Designer this month. Lee-Anne is a mixed media artist. 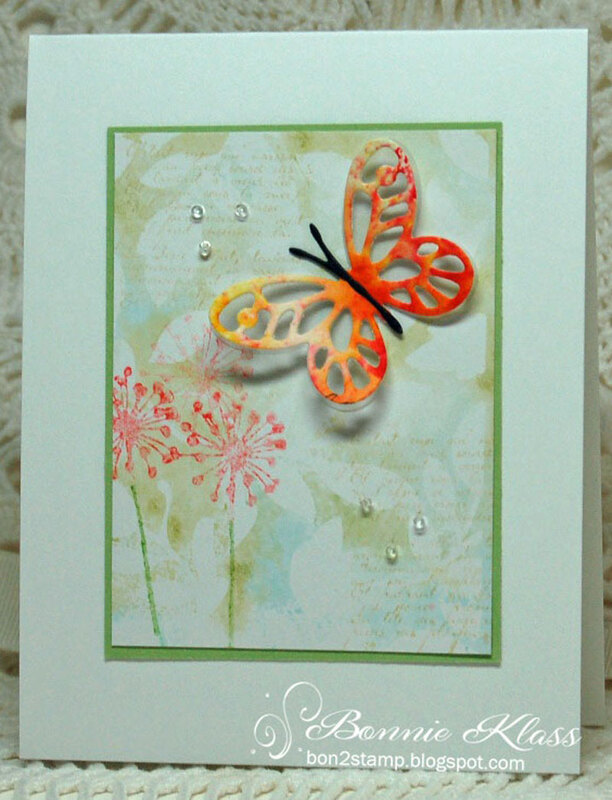 She loves to make CAS cards and frequently combines CAS and mixed media in her amazing designs. 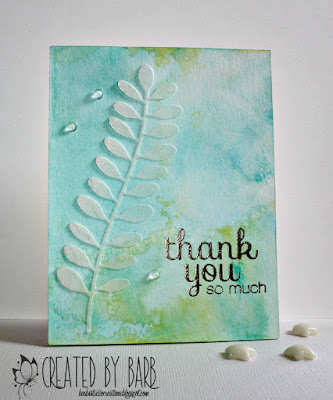 Please visit her blog to see how she created her beautiful card below. 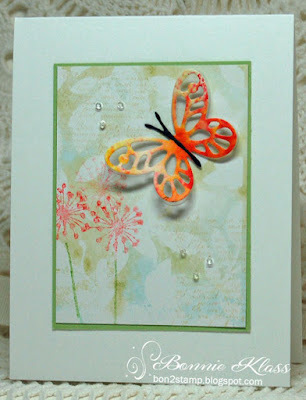 - Embossing Paste and Stencils by Laura Bassen (6:15) --- Laura shows the look of lots of different embossing pastes. 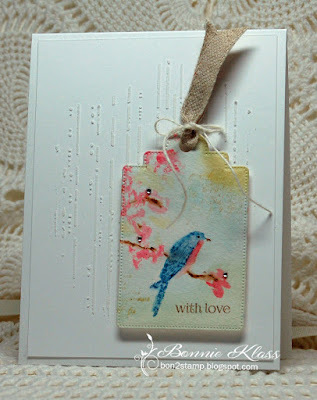 See Bonnie's sample card of her embossing paste stenciled background. - Stamping through a Stencil by Justine Hovey (3:35) --- Easy and fun technique. See Lee-Anne's sample card with stamping through a stencil. - Stenciling Monoprint by Lee-Anne Cross (6:50) --- great way to use the negative side of a stencil. 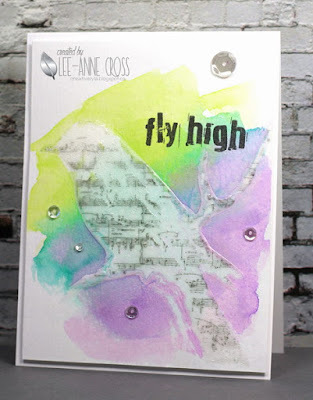 See Loll's sample card with her stencil monoprint background using the negative of the stencil, along with her embossing paste through the positive of the same stencil. The challenge is open until April 24th, so there's lots of time to play along. Come join in the fun! Grab your stencils and join us!